At the Centeno-Schultz Clinic we acknowledge that knee pain can be debilitating and severely impact an active life style. Stem cell treatment is an alternative to traditional knee surgery. Hyaluronic acid (HA) is a thick liquid that helps lubricate the joints and is used routinely in the treatment of knee osteoarthritis. Different brands of hyaluronan are available and include Euflexxa, Hyalgan and Orthovisc. Platelet rich plasma is a concentration of a patient’s own platelets which can be used in treat degenerative knee disorders. Many professional athletics have undergone PRP injections including, Hinds Ward and TigerWoods. Is PRP better than HA for knee osteoarthritis? Cerza et al recently published such a study. 120 patients with knee osteoarthritis were divided into two equal groups and underwent weekly intra-artricular knee injections for 4 weeks. One group received hyaluronic acid injections whereas the other group received platelet rich plasma. Platelet rich plasma showed signficantly better clinical outcome compared to treatment with HA. PRP was associated with a faster onset of relief that continued up to 24 weeks. Unlike HA which had poor results with patients with advanced OA (LC 3) PRP showed no statistically signficant difference with varying severity of osteoarhtritis. In 2013 when you doctor recommends a hyaluronic acid injection for your knee pain ask about the superior PRP alternative. At the Centeno-Schultz Clinic stability is critical as evidenced in our SANS approach: Stability, Articulation, Neurologic and Symmetry. Joint stability is essential for optimal clinical outcomes. Accurate needle placement is equally important and is accomplished through direct visualization either by MSK ultrasound or x-ray or both. The posterior cruciate ligament is large ligament in the knee that provides restraining force to straight posterior translation of the tibia relative to femur. It originates from anterolateral aspect of the medial femoral condyle and attached onto the posterior tibia. VM is a 32 y/o snowboarder seen in clinic today with knee instability and pain. 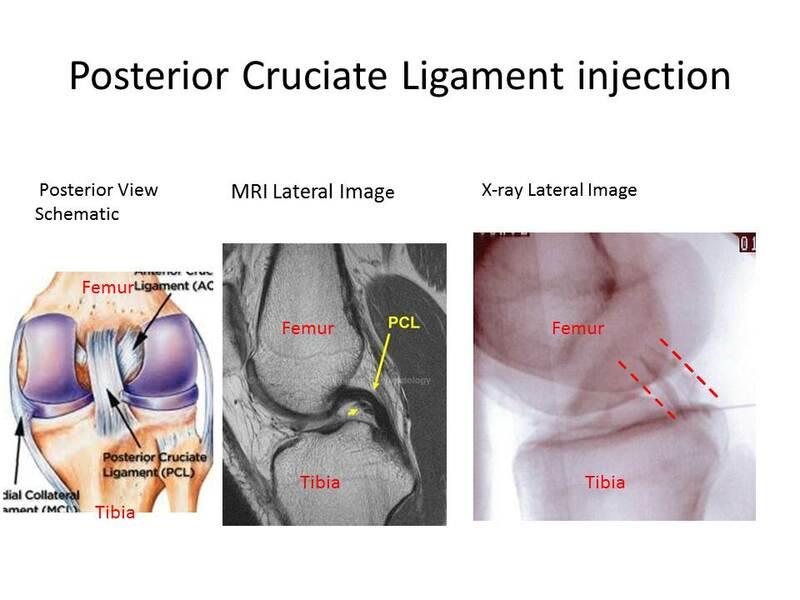 MRI was significant for partial tearing of the PCL and swelling at its tibial insertion. Below is an x-ray image of the PCL injection. A posterior approach was utilized. The femoral nerve and vasculature was identified by MSK ultrasound. Thereafter a 25 gauge need was advanced into the PCL at the tibial attachment. A small amount of contrast was injected with filling of the PCL. Patient hopes to return to riding soon and we are expecting snow this weekend. At the Centeno-Schultz Clinic we acknowledge that low back and leg pain secondary to disc degeneration can be disability and severely restrict one’s activity. Regenexx PL has been used successfully in the treatment of back and leg pain. PL denotes platelet lysate which is a process conducted at our state of the art lab. The growth factors within the platelets are released from the cell membrane making them immediately available for healing. Below is a recent clinical success utilizing platelet growth factors. SF is 58 y/o hiker who presented to the Centeno-Schultz Clinic with 2.5 month history of right leg discomfort and weakness. Onset of symptoms was atraumatic and occurred while hiking. Weakness was constant and SF had difficulty with lifting his foot which made hiking difficult. Initial treatment included oral steroids x 2 despite the side effects associated with steroids. MRI of lumbar spine was signficant for broad-based right disc protrusion which displaced and flattened the right L5 nerve root. This would explain his foot drop. SF returned to clinic today after two x-ray guided Regenexx PL-M epidural injections. He reports 90 % improvement in discomfort and 80% improvement in right leg weakness. He avoided surgery and is now back on the trails hiking due to the benefits of platelet growth factors. During my New Year’s day practice I noted the absence of a favorite instructor. She had suffered a shoulder injury last week. Injuries to the rotator cuff, labrum and shoulder ligaments can occur in yoga. Upward-facing dog and downward dog are particularly stressful on the shoulder and can lead to inury. I was surprised to learn that she had received a cortisone injection especially given the risks associated with steroids. In 2013 the Centeno-Schultz Clinic provides some health guidelines for patients. 1) Know the source of your pain. It is not enough to simply look at the MRI or x-ray. 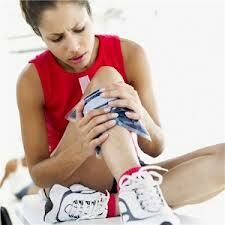 2) Use diagnostic studies and physical examination to identity injuries. Studies include but are not limited to x-ray, MSK ultrasound, MRI and CT.
3) All injections need to be performed with guidance. At the Centeno-Schultz Clinic all injections are performed with either MSK ultrasound or x-ray. This ensures accurate needle placement and best clinical outcomes. 4) Avoid high dose steroids given their risks. 5) Consider regenerative therapies including platelets, prolotherapy and stem cells therapy. 6) Know that surgery may limit your future treatment options and advance the underlying condition. 7) Evaluate stability, articulation, neurologic and symmetry for maximum clinical outcome.